My experiences with the Nanozwerg were enough to warrant buying it’s slightly bigger brother. The oscillators sound good, the modular functions keep surprising you with new sounds and Manfred Fricke always squeezes a few extra functions in the machine, in this case by using a ‘shift’ button. The shift button plays a major role in this machine, as this is the button you use to change between filters 1 and 2, the 2 oscillators, and the LFO settings. The normal oscillators and low frequency oscillators feature the familiar triangle, saw and square waveforms but both OSC’s and LFO’s have an extra trick up their sleeves. OSC 1 features a ring modulator while OSC 2 offers white noise, the LFO has an added ramp in it’s waveforms while LFO 2 has sample & hold. 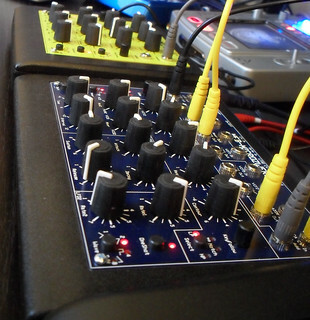 The Nanozwerg’s bigger brother brings more modularity and patch points than it smaller sibling (the smaller yellow synthesizer pictured on the left). It looks a bit cooler in dark blue with it’s many patch points above the controls, but together they offer a very cool modular combination. Both dwarfs (zwerg being the German word for dwarf) also go well together by using both machines together using the CV (control voltage) in- & outputs. 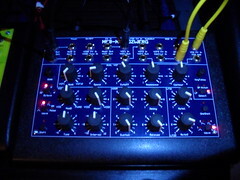 The audio signals can be combined via the ‘VCA (voltage controlled amplifier) add’ and filter inputs. The downside also being the same semi-modularity, with an emphasis on ‘semi’. Not everything can be done, like the lack of being able to adjust the incoming CV value, or scaling as it’s called. This is where a full modular rack would really step-up the sound-designing game. Like the Nanozwerg the filter isn’t awe inspiring but does it’s job well with the 12dB per octave it offers. The resonance is a bit too eager to scream, but together with a distortion pedal this doesn’t have to be a problem. Since I would really would like to expand my studio with a full modular synth in rack format, I’ll probably make use of external filters pretty soon anyway. And there’s always the option to use plugin’s (within a digital audio workstation) to do the filtering. I already play my synths via MIDI inside a DAW and triggering a digital filter is as easy as using the same MIDI notes to trigger the filter’s cut-off. Because I’ve already tested the Nanozwerg the Micorzwerg isn’t surprising me soundwise. Well, not a lot as I’ve already heard some mad things I didn’t expect when dialing in the sounds. It’s modular side however probably still holds many secrets for me that I’m more than ready and willing to find out. Yeah, it’s not a Moog, but at this price I really don’t care! A great synth to start with to try if analog synths are what you’re looking for. It’s many patch points will stay valuable even if you already expanded your modular synth set-up beyond the capabilities of the Microzwerg making it great value for money.